This is the first paperback Danish edition of Coyote Waits. It was published in 1991 by KLIM in Århus, Denmark. The text was translated from Tony Hillerman's original English to Danish by Søren Barsøe. The cover was illustrated by Nils-Ole Lund. 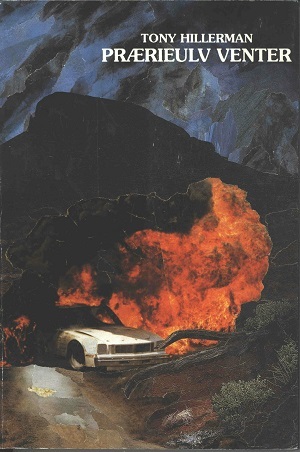 The cover art depicts a white car engulfed in flames with a mountain in the background and a pile of brush in the foreground. Format: Paperback, 21.4 x 14.3 cm. Binding: Full-colored paper covers with the author, title, and publisher printed in white vertically on the spine.